This post has been contributed by Thomas Slatter, Communications Volunteer with the Stanley Park Ecology Society (“SPES”). Super Slime in Stanley Park! 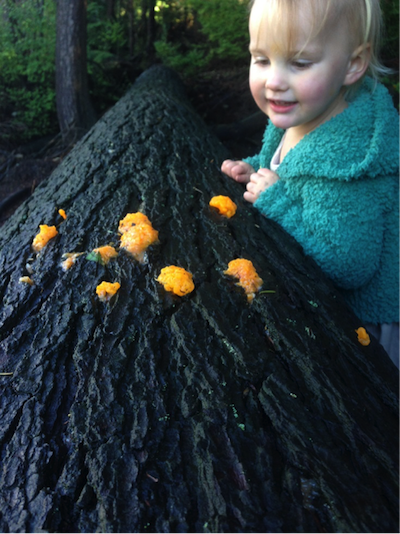 You will probably have come across slime moulds in one form or another in your treks through the forests of Stanley Park. More often than not you’ll have walked past these fascinating organisms without a second glance. To be honest, why wouldn’t you? They’re mostly innocuous, often confused with mold or fungi. 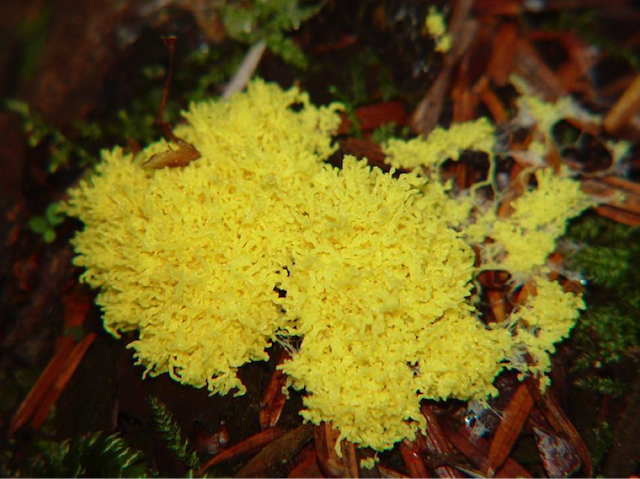 But if you know what to look for, you’ll quickly spot these strange oddities throughout the forest: clumps, blobs or spheres of slimy, bright colored gel sporting names like Toothpaste Slime mould or Dog’s Vomit. Stanley Park visitor. Photo: K.Stormont. They spread out in seeking tendrils, grasping and engulfing any food they find. They’re made up of eukaryotic cells (nucleus-containing), just like us, and yet could not be more different. However, like everything in the natural world, when you look deeper at the true nature of the slime you find an incredible mix of complexity and simplicity. Slime moulds are not really moulds at all. In fact ‘slime mould’ is just the name given to a group of single celled organisms that, while capable of living independently, have grouped together. Upon grouping together, the cells lose their individual cell membranes and become a super-cell. With this internal openness, the cells are able to transmit chemical data rapidly throughout the entirety of the ‘slime’, and thus react to external stimuli and make ‘decisions’ far faster and beyond the realm of a single, individually ‘minded’ cell. Slime mould is, in fact, more akin to a biological computer, a single celled brain as it were! It is essentially a living data-transfer highway, with every part of a slime mould being connected to every other part, through a continuous ebb and flow of chemical information. Through this it is able to work as a single cohesive unit. It is the sum of all its individual cells and their nuclei, and thus more ‘intelligent’ because of it. It is able to solve rudimentary problems, such as the quickest route to food. Upon establishing itself on a nutritious piece of detritus (like fallen leaves, paper or another source of carbohydrates), it will send out fractally branching tendrils. If these tendrils touch food, the cell will reestablish itself on the new food source. If they touch each other, the cell will withdraw from that area and branch out in another direction. In an interesting experiment, people were linked together and asked to navigate their way around a maze as fast as possible. They were unable to beat the rapid, single-mindedness of slime mould put in a proportionately sized maze. The participants inability to work together and their individual egos hindered the speed of the overall unit. The slime mould’s ability to lose individuality, in a literal, cellular sense and act as a single entity allowed it to overcome problems faster than multiple higher intelligences working together. As if that wasn’t amazing enough, another experiment demonstrated something even more incredible. Slime mould dislikes the cold and dry. Both of these will cause the cell to concentrate its ‘body’ into a small area, while it waits for the moment to ‘crawl’ away. What is incredible is that if the slime mold is subjected to temperature changes at periodic intervals throughout the day (causing it to withdraw temporarily), it will begin to pre-empt each temperature change before it even happens. In essence, it will learn. 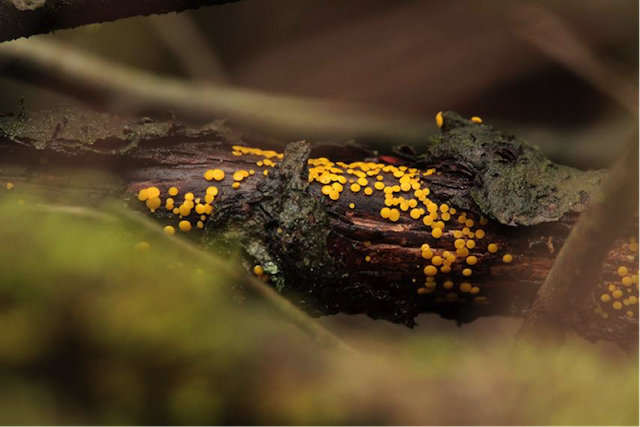 Far from the mouldy, gross-looking fungus you might have thought it was, slime mould is not only biologically incredible, but also raises deeper questions of intelligence, bio-engineering and computing, and ultimately the philosophy of individuality versus a unified whole. Awesome! Myxomycetes sp (toothpaste slime mold) in Stanley Park, Beaver Lake Loop. Photo: Peter Woods.